The last time I went to Target, I saved $14.26 - and I didn't clip a single coupon. If you (like me) find that getting to a grocery store is in and of itself worthy of Olympic gold, chances are that you're always looking for ways to save money without coupons. 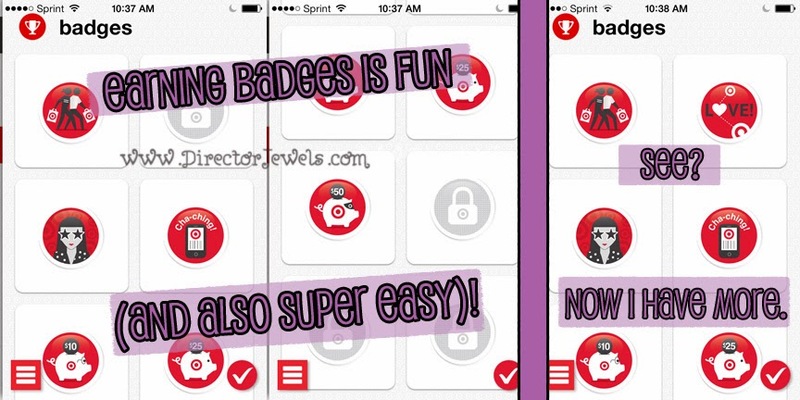 So you have no idea how excited I was when I found out about Target's Cartwheel app. I saw posts about it on social media for weeks before I actually downloaded it to my phone. I remember thinking, sigh, it's probably just more work that I don't have time to do. I was totally wrong. If you haven't given it a chance, read this list of reasons why you should have it - and then download it right now. You can thank me later. Here's the gist: use this app to find savings offers (usually 5% or greater) for items you are probably already purchasing. WIN WIN WIN. 1. It's so much easier than clipping coupons. Before I threw away all of my coupons, I was once upon a time a contract coupon blogger. I spent hours upon hours finding, printing, clipping, filing, saving, and using coupons. Going to a store for a "coupon trip" required hours of prep time and the ability to focus at the register to make sure I was achieving maximum savings. Now? I'm lucky if I get through a checkout lane without Lincoln climbing up on the moving belt or no one pulling seventeen candy bars or lip balms off a display rack. I don't have the energy to be a couponing superstar anymore. 2. If you clip coupons or have a RedCard anyway, you can stack your savings. I know you're out there, mom who somehow can get two to three children in and out of a shopping cart without a food bribe, and even though you kind of disgust me with your incredible awesomeness, I respect you. 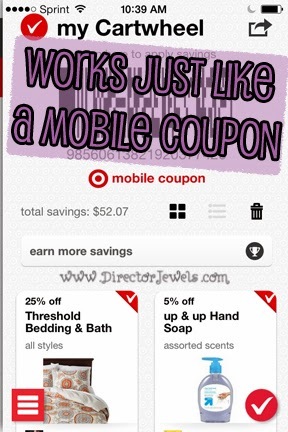 And the good news for you is, Cartwheel offers can be stacked with both regular manufacturer coupons and Target store coupons - either printed or mobile. Hello savings fest. Also, heads up RedCard users - Cartwheel offers savings in addition to the 5% you already save everyday. 3. You can still find a coupon while you are at the store. There's no more need to be a super prepared shopper. I am personally guilty of standing in the main store aisle, eyes trained on my smartphone as I soothe kids, smile at passersby, and quickly search for every single item in my (usually overflowing) cart to find a last-second deal. I had a bad habit, as a couponer, of leaving my coupons for a trip at home. No more feeling guilty because - yay - you can save money anyway now! 4. Everything Target sells is awesome, and now it's less expensive. Going to Target is a lot like going on vacation in my book, and I seem to always find several things I need in the Home, Kids, Women's, or Stationary departments - even if the only reason I went to the store was to buy cheese and eggs and organic apple juice. These purchases are more easily justified when you are saving five percent, right? It's like the best day ever when you find a higher percentage deal for something in your cart. 5. You can stalk your friends and find out what they're buying. Since my job is steeped in social media, I spend a lot of time on Facebook. So you can assume that I'm a chronic casual Facebook stalker. Oh - that's not just me? Well, awesome. Now, nosy people like you and I can find out what things our friends are searching for and even buying at Target. Bring on the yogurt wars! Conveniently, coupons for things like underwear are automatically private. Thanks, Target! 6. You're rewarded each time you reach a savings threshold. What's better than saving money? Getting prizes for saving money. When you first install Cartwheel, you get a fixed number of "saving spots" - these are where you save the offers you want to use when you checkout. If you, like me, tend to buy everything in the store, you'll want to rack up extra savings spots so that you can maximize your potential to save. 7. 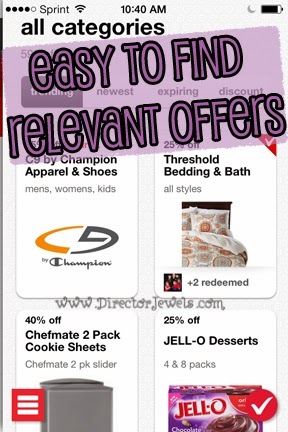 You sometimes score amazing deals with one-day Cartwheel offers. 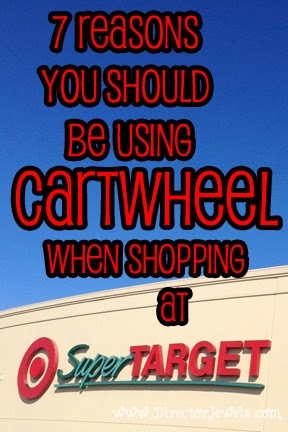 Every now and then, you might receive a notification or email alert that there is a special Cartwheel offer available. Add it to one of your savings spots immediately if you find it - I once missed out on a 50% off women's apparel deal and was super bummed! My favorite surprise deal was 50% off all boxed holiday lights last Christmas. We got some really fun lights to add to our tree this year! Are you convinced yet? If not, you should be. Go give the app a try. If you're a regular Target shopper, I promise you won't be disappointed! You can download for Apple products here and Android here. Winnie the Pooh and McStuffins, Too!